Hebrew-Portuguese Haggadah debuts to help descendants of Jews forced to convert return to their roots. 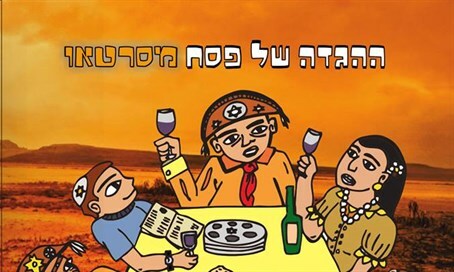 The Brazilian community of descendants of Spanish and Portuguese Jews published the first ever Passover Haggadah, titled A Hagadá de Pêssach do Sertão for other Anousim in Hebrew, Portuguese and Portuguese transliteration. The Anousim community are the descendants of Jews forcibly converted by Spain and Portugal centuries ago. “The illustrations also provide a taste of our country, with traditional Brazilian northeast relief painting, typical for the area of Sertão, a region of Northeast Brazil, where many Anousim settled," Kohler added. The Haggadah includes many traditional Passover songs in Ladino, and follows the tradition of the Portuguese Amsterdam Hagadot, and was edited and produced by members of the Recife Sephardic Association. Recife is famous for having the first synagogue of the Americas and home to many descendants of Spanish and Portuguese Jews forced to convert to Catholicism during the Inquisition. The Haggadah is illustrated with traditional Brazilian relief printing art. Ashley Perry (Perez), President of Reconectar, an organization whose goal is to reconnect the Anousim with the Jewish world, and assisted with the project, also spoke about the significance of the Haggadah. “The traditions of their ancestors are alive and well in the Spanish and Portuguese Jewish tradition and it is very exciting for both our communities to reconnect with their roots. The Twenty-First Century is providing both the millions of Anousim and the Jewish world with an unprecedented opportunity to reconnect in a way impossible in previous generations and we dare not miss this opportunity."